it does take a pueblo to raise a child. Across town small groups of kids, boys and girls, play games kicking a ball. Soccer, futbol, is a national pastime. 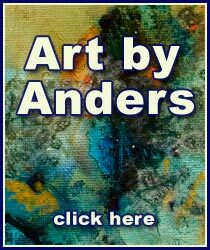 It is played on dirt fields, grass patches, paved and unpaved roads. 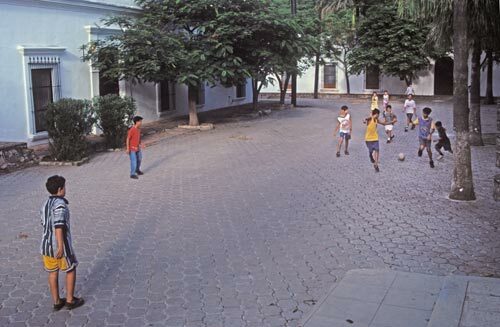 Here, the playing field is Calle Molina Galeana in front of an entrance to Hacienda de los Santos SA de CV. All players, on both teams, no matter the score, will win. The sound of a bouncing ball and joyful enthusiasm of children making up rules as they go, priceless. This is what life is all about, this moment, moments that are both serious fun stuff. Here, conspirators whisper confidential information and in the next instance gleefully whoop and cheer for this or that. These are kids doing what kids do in an environment that is safe and nurturing. The house on the left was the home of Noli Ernaldo Garcia. On the right was Antonio Figuerro’s studio and rented house. At least once a day I walked on this one block street, it was a short cut connecting Calle Galeana and points southwest and the Alameda, Plaza and points east. There are places where one can sit in the shade and peek at the world. Boys playing soccer take a break to write their names in one of Anders’ photo work books. Jose Guillermo Calderon Q,, Jose Maria Palomeras V., Erwin Marques Valenzula and Rafael Valenzula Vega are four more faces and names linked together for the future to look back and recognize. 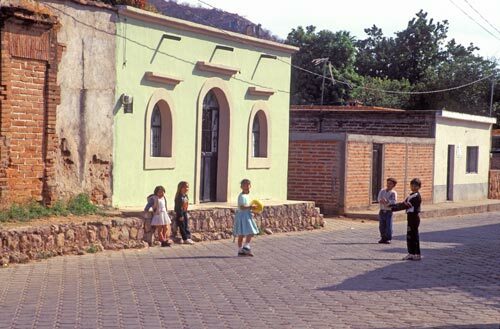 Their playing field is the alley between Calle Guadalipe Victoria linking Calle Alberto Guiterrez and between the Museo La Construmbrista de Sonora and the old two story Alamos Hotel. Preparing for the Independence Day Parade that will end in the Plaza. During the week leading up to Independence Day school kids practice marching through the streets. Red, white and green will be seen everywhere: symbolically red represents union, white represents religion and green represents independence. On September 16th, these kids will be marching sharply in their school uniforms through parts of central Alamos along with government officials, municipal workers and band. Admiring spectators line the parade route’s streets, many will follow the procession to the Plaza. In 2010 the students added their own uniformed marching band to the parade. From children to government, Alamos continues. All of the schools, all of the classes and all of the students come together. School kids, municipal employee, government officials and admiring bystanders gather in Plaza de las Armas for ceremonies to begin at 11 am. 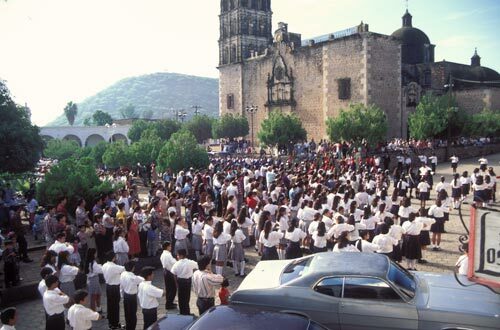 Across Mexico’s outdoor meeting places and plazas there is a moment of silence that begins as the church bells strikes eleven o’clock and ends with the last strike of eleven. And then the speeches begin. Father Miguel Hildago on September 15, 1810 called out to his congregation to fight the ruling Spanish. His words, “Viva Mexico” and “Viva la Independencia” are repeated and celebrated each year. 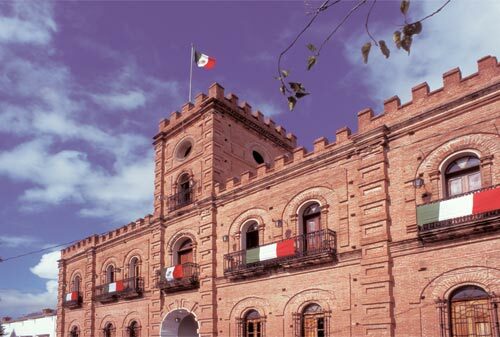 September 15 is the eve of Independence day, followed by the 16th, Independence Day, “grito de Independencia”. Banners have been hung in preparation for Independence Day celebrations. 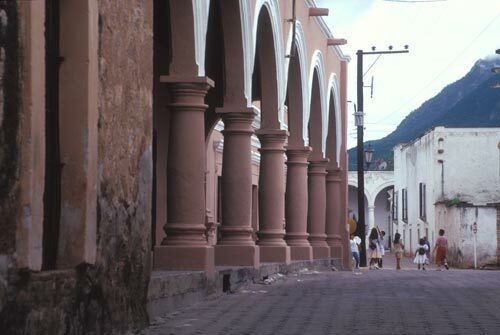 In the hearts of many, Álamos is the center of the universe. Independence day starts early in the morning with a municipal parade through the town’s colonial center. 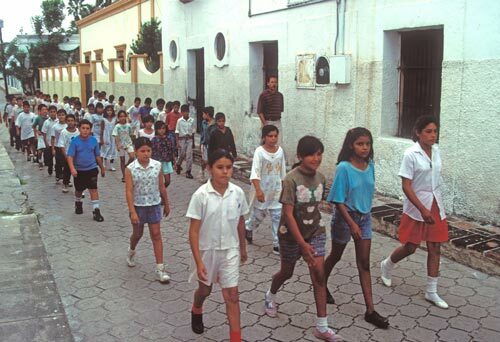 Alamos school kids, the first high school in the Californias started here, and the entire city government take part. In 2010 the students added their own uniformed marching band to the parade. 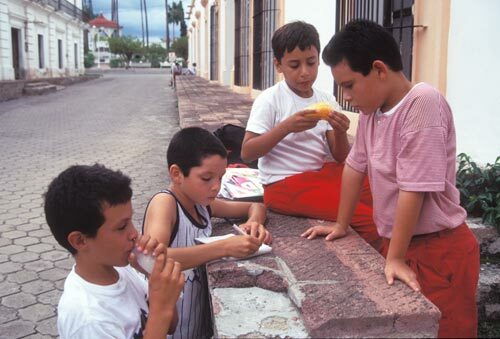 From children to government, Álamos continues.